Picking away at the few small issues with my new to me 06 e55. I replaced the busted command head unit and eveything works great, except the navigation. I press"navi" and i get the "please insert DVD into trunk". The DVD is inserted, and yet the same error message still displays with no navigation. Is the navigation DVD bad, or the DVD unit itself? Get a can of air duster and try to blow out the DVD drive, could be dust on the lense. You can also try and burn a new copy, it's out there if you search for it. DVD ejects and inserts easily. Just seems to get in there and make some noise and nothing happens on the command screen. Did you try another DVD? It's possible the DVD drive is bad, that happens too but it's rare. Either pick up another one on eBay or risk trying another generic DVD player. There's an older thread where someone got a generic brand DVD player and it actually worked. Guess it depends how close it was to the Mercedes one. Update. Orders a new 2015 update DVD, and the screen would endlessly loop "navigation loading". With a little research I realized the DVD drive may be bad. Found one on ebay for $30 and tossed it in last night. Bingo. 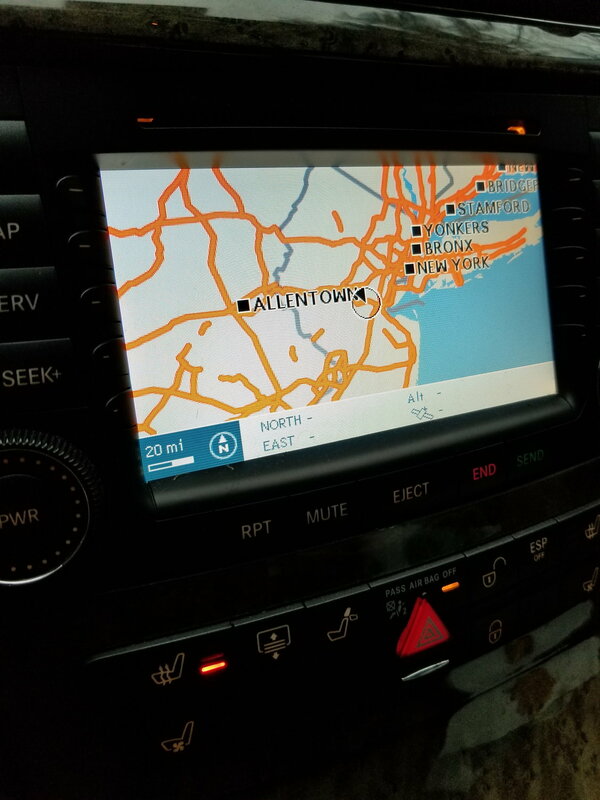 Now, the only problem that remains is that the navi thinks I am in new jersey. I am in southern NH. I drove it a few miles to work today to see if it would sync but no dice. The direction arrow changes as I do and the "car" appears to move down roads, but its just in the wrong area. Any tips? Also unrelated but what is this thing back here with all the colorful hoses? part of the air ride? Is it OEM? Also maybe worth noting. I replaced my trunk mounted brake light this week and when putting it back together there was one connection I could not find a home for. Sort of looked like the antenna connection. Could this be my issue? Also unrelated but what is this thing back here with all the colorful hoses? The bottom of the screen shows no data; did you take the photo while under cover with satellite signals blocked? You should have lat/long, altitude about sea level, and number of GPS satellites within sight of your receiver on the bottom of the screen. 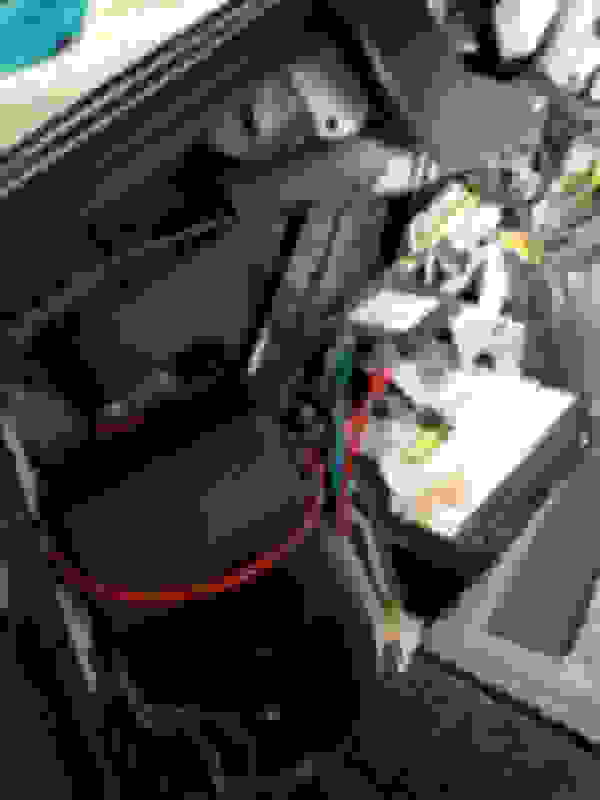 If it remains blank, take a look that the GPS antenna cable is connected. The antenna on top of the rear window is the CTEL/GPS antenna. There is an antenna splitter located on the driver's side of the trunk hidden behind the trunk hinge. The antenna on the trunk lid is for satellite radio. Last edited by bbirdwell; 02-08-2019 at 04:51 PM. I doubled check the antenna connection at the back of the DVD navigation drive, and it is solid. Does that splitter have anything to do with the navigation? If so I will check it out and see if there is excessive corrosion. I haven't disassembled my car to follow the antenna leads. Having said that, a bad splitter will cause an SOS/Teleaid malfunction message. So I would hypothesize one antenna lead from the CTEL/GPS antenna on the rear window to the splitter where one lead should go to the navigation unit and the other to the cellular unit. I'll see about getting into the parts catalog today and see what is shown for antenna leads. EDIT: the parts catalog indicates a splitter that is an active duplexer for GPS; using my car's VIN however, shows no splitter installed but I've seen it in my trunk! Plus there is a harness for GPS amplifier to diplexer. Photos? No luck. Last edited by bbirdwell; 02-12-2019 at 11:21 AM.